Financial Market Vigilante: Is the U.S. Energy Boom all it's “Fracked Up” to be? Is the U.S. Energy Boom all it's “Fracked Up” to be? You can hear the heightened expectations in the current business news every trading session. The exploration and production activities which are cranking up in the Bakken, Eagle Ford, Marcellus and other plays are producing a glut of oil and gas which will lead to energy independence and cheaper energy well into the future for American consumers. Laudable goals and U.S. citizens which think to the contrary are definitely a minority. 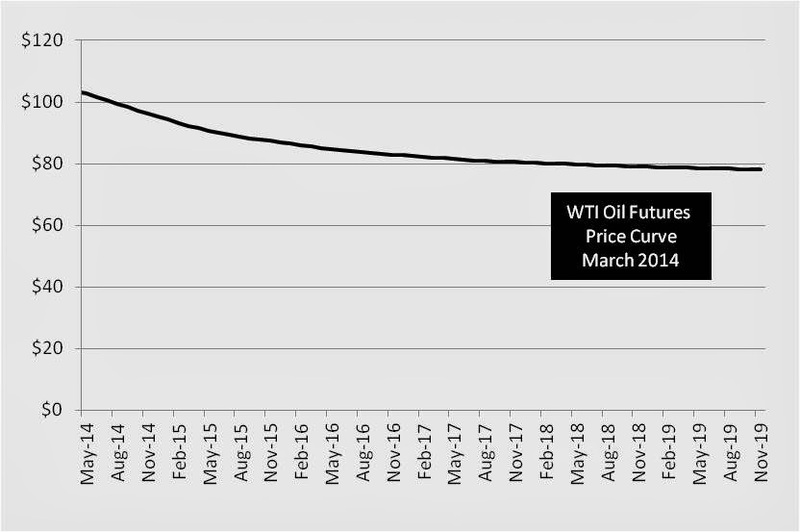 The expectations have become so ingrained the psyche of the market that the forward price curve for the benchmark WTI NYMEX delivered crude oil shows lower price levels on contracts reaching as far into the future as can be seen visually in the graph below. market to deliver on the heightened expectations. However, this is not what has me most concerned about the current hype in the market. My concern is more fundamental, and rooted in the assumption, which appears false, that the oil glut expected can be economically produced by horizontal drilling. There is growing evidence that the capital expenditure costs to extract proven reserves is much greater than originally estimated using historical standards. Additionally, without costly on-going expenditures the reserves which might be expected to be recovered cannot, and probably will not deliverable to market. To postulate that the energy boom being portrayed in the business media is more hype than reality requires data. Much of the data to support this position is buried in SEC filings of E&P partnerships which is very difficult to decipher and cannot be easily assimilated by an investor without insider knowledge about various company activities. Most these E&P operators are continuously drilling and the well performance issues being encountered can be hidden in the financial results as long as new wells are being aggressively brought on-line. To bring into focus the developing systemic issue which the oil & gas industry is beginning to realize, separate drilling programs across a broad subset of plays which have a set start and stop timetable is needed. To get at publicly available data which meets these criteria, I have assimilated the proven reserve reports from different oil & gas E&P fixed termination date Trusts which went IPO between the years 2010 and 2012. 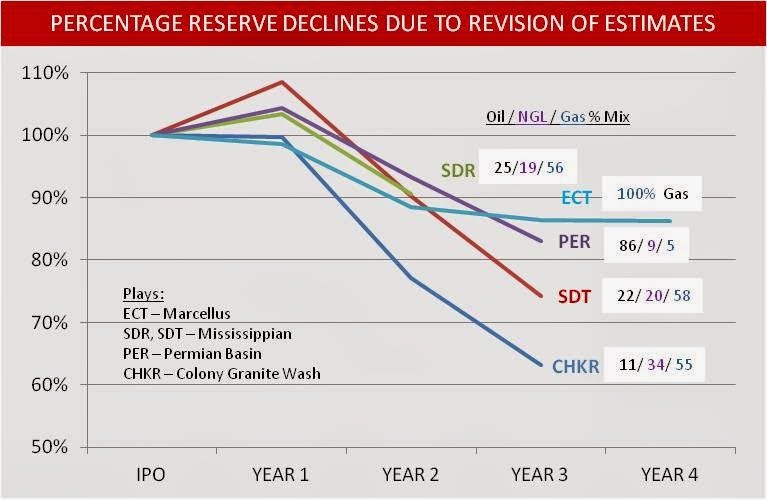 The five Trusts (CHKR) (SDT) (SDR) (PER) (ECT) are listed in the table below along with the proven reserve level transferred to the Trust at IPO, and the revisions to estimates made to the reserves each year post IPO. Actual production is not included in the data, only the revisions. Each of the Trusts have a set number of wells which either have been drilled since the IPO, or are still in the process of being drilled (as in the case as of March 2014 for CHKR, SDR and PER). The wells were defined to be a set lateral length when the Trust was set up, presumably to cap the capital expenditure required by the operating partner and make the Trust economically viable. There are three different operating partners which are providing the drilling activities associated with the Trusts in the analysis. The Chesapeake Trust is being drilled by Chesapeake Energy (CHK), the SandRidge Trusts by SandRidge Energy (SD), and ECA Marcellus by Energy Corporation of America. Both SandRidge and Chesapeake Energy have exhibited financial difficulties over the past several years which may be a factor in the drilling results if it can be determined that the operators are not delivering the program promised in the contractual agreement with the Trust. However, rumor and innuendo aside, the results that are being reported across all of the various plays are woefully short of the initial proven reserve estimates which were provided in the IPO prospectus when the funds were raise in the public market to create each Trust. The downward revision to estimates which have been announced by each Trust since its public offering can be seen visually in the following graph. Each of the Trust in explaining the revisions to their unit holders have referenced “well performance” issues as the source of the decline in the proven reserve estimate. Proven reserves by definition are by probability expected to be at least 90% recoverable, versus probable reserves which are only 50 / 50. None of the Trusts after 2-3 years of operation have met the definition of proven reserves relative to its initial portrayal of estimate given in public filings. In the worse case, CHKR is approaching the definition of probable reserves. In the case of ECT, there has been a noticeable leveling off of the initial decline in the 3rd and 4th year. In the case of ECT, drilling was completed very quickly and initial well pressure was reported as very high and subsequently declined very quickly. New wells were not being drilled in year 3 and 4 at ECT, and the relatively small declines post drilling have been due to small changes in well pressures. The remaining Trusts, however, were all undergoing continued drilling operations in year 2 and 3 of operation and well performance issues were rampant across all the plays. One further question about the sample being used in this analysis is whether there is a fundamental issue with the AMI (area of mutual interest) being drilled which has been transferred to each of the Trusts – the so called pushing off the bad areas on the Trust while the operator keeps the prime areas for itself. In reviewing the data, there is no evidence that this is actually happening. The most likely culprit for the poor well performance across all of the Trusts is that the E&P cost for horizontal wells is turning out to be much higher because of highly variable results and the tendency of new wells to have high initial pressure which tails off very quickly. This explanation is consistent with the data compiled on the Trusts in my analysis, and is corroborated by data which is being compiled by companies such as Drllinginfo Inc. and Evaluate Energy mentioned in the recent Bloomberg News article: Dreams of U.S. Oil Independence Slam Against Shale Cost. The boom’s boosters have given rise to the misconception that wringing oil and gas from shale can be easily replicated throughout the country, Patzek said. That isn’t the case, he said. Every rock is different. The Bakken shale, along with the neighboring Three Forks formation, covers an area larger than France, according to the IEA. An oil-bearing formation that’s 400 feet (122 meters) thick in one spot may taper off to nothing just a mile away, Patzek said. What works for one well may yield little in a neighboring county. The output of shale wells drops faster, too, falling by 60 to 70 percent in the first year alone, according to Austin, Texas-based Drillinginfo Inc. Traditional wells take two years to fall by about 55 percent before flattening out. That forces companies to keep drilling new wells to make up for lost productivity. “You keep having to drill more and you keep having to spend more,” said Mark Young, an analyst with London-based Evaluate Energy, which tracks production and its costs. Investors in the Trusts reviewed in this article have all suffered significant declines in value since their IPO. During a time period in which the major market indexes (SPY) (DIA) moved up significantly to all-time highs, the unit price of each Trust moved on average from around $20 at IPO to well below $10. Each has experienced a capital loss of over 50% since IPO. Capital markets are sometimes slow to respond when entrenched positions in need of further capital for survival suppress the underlying weakness which is being masked by the media hype. Investors need to beware that plowing capital into these energy projects at current energy prices is very likely to be a bust. The misleading aspect of the investments is caused by the initial glut of production which is pushed on the market by the drilling activities as the wells blow off a high degree of reserves that will be recovered in the first 12 months. This spike in supply can inhibit normal market adjustment processes and send a false signal. In my analysis, most likely the most misleading indicator in the market today is the forward WTI oil curve. Based on the data, U.S. production of crude oil using horizontal drilling in shale plays is not economically sustainable below $100 per barrel. More likely the price level will need to be substantially higher if the Trusts are any indicator, as they have lost 50% of their capital value and oil has remained in the $100 per barrel range throughout. Natural gas, likewise, must rise and remain above the $4 range it recently recovered to after being pummeled by all the excess supply which swamped the market in 2011 and 2012 from new drilling activity. Infrastructure constraints on pipelines and storage are keeping the expansion of natural gas in check in the U.S. as supply is more readily economically created through drilling programs than crude oil. Why is the mundane topic of the cost of extracting crude oil in the U.S. market important to the financial markets? In short, it is because “energy is the lifeblood of the economy.” In my recently published book, Theory of Financial Relativity, I present the history of the stock market from the perspective of the primary correlating factors that invariably line up each time the U.S. stock market has a major correction. 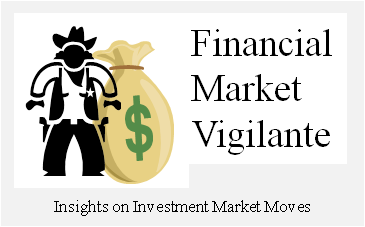 Equity analysts when they attempt to predict the next market downfall are usually attracted to the usual suspects of Fed interest rate and monetary policy, GDP growth rate and government fiscal and tax policy. However, these factors in isolation alone almost never cause the economy to go into recession, and correspondingly the stock market to swoon other than for brief episodes. As explained by the Theory of Financial Relativity, the primary agitator that usually triggers a stock market reaction (up or down) is the relative price of energy, with crude oil being a good benchmark to track. The historical evidence of the relationship between the cost of energy and the relative value of the stock market can be easily seen in the following graph. The detail behind this graph and the corresponding stock market declines (see maroon shaded area) is contained in the book. 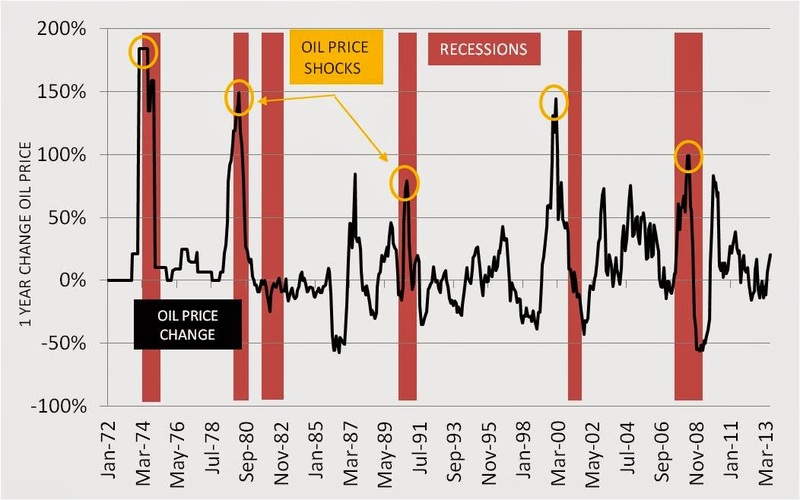 In the post WWII history of the U.S. financial market, and particularly since the U.S. abandoned the gold standard for monetary policy in 1971, the spiking price of crude oil, usually in response to out of balance U.S. monetary and fiscal policies, has been the precursor to a major stock market corrections. The current excessively accommodative monetary policy by the U.S. Federal Reserve over the past 5 years, and particularly since the beginning of QE3 in 2013, has been strongly aided on a relative financial basis by suppressed prices for energy in the United States. The capital unleashed in the energy sector by the Fed monetary policy, and the short-term glut in supply which is a better understood phenomenon about horizontal drilling now than it was in 2010, has kept a lid on energy price levels allowing the Fed to freely pour liquidity on the market without the typical pick-up in inflationary pressures. There are other factors inhibiting inflation as well, such as the much tighter regulatory measures on bank lending which has forced a large portion of the Fed liquidity to remain as excess reserves parked at the Fed collecting .25%. But a large portion of the liquidity that has entered the market has beaten a path to the energy market through Master Limited Partnerships (MLPs). Contrary to the typical expectation that high levels of quantitative easing by the Fed lead to inflation, the opposite has transpired as increased energy supply has, at least in the short-term, kept oil and gas prices from re-acting in the typical fashion to excessive monetary policy actions. The issue that investors must beware of as the Fed withdraws its QE liquidity program is “what happens as the capital begins to dry up in the U.S. energy sector?” The most likely possibility and the signals to watch can be better understood by studying the information contained in the book. 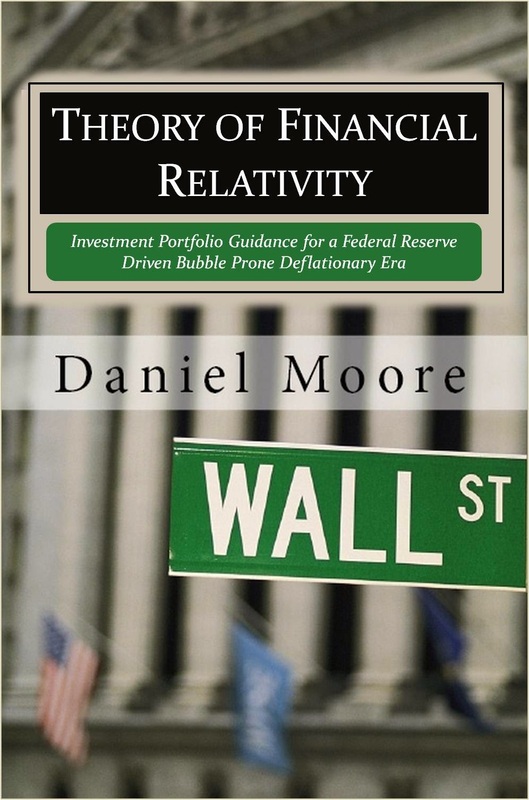 Daniel Moore is the author of the book Theory of Financial Relativity: Investment Portfolio Guidance in a Federal Reserve Driven Bubble Prone Deflationary Era. All opinions and analyses shared in this article are expressly his own, and intended for information purposes only and not advice to buy or sell.